The lands of Arkansas with its natural resources include abundant water; vast forests of quick-growing pines and valuable hardwoods. There are extensive deposits of oil, natural gas, and many other minerals. The first Europeans were Hernando de Soto’s Spanish expedition which crossed the Mississippi River to Arkansas in 1541, spending several months in the area. It would be the late 1600s when French expeditions came to the Arkansas areas. In 1686, Henri de Tonti founded Arkansas Post, the first settlement in the lower Mississippi River Valley. It served as a trading post, a way-station for Mississippi River travel, and the home of a Jesuit mission for a few years. The French later established several settlements south of the Arkansas Post in 1699, including Natchez and Orleans. In the 1760s, France ceded lands west of the Mississippi River to Spain. Spanish rule was established in 1766, but not for long. Eventually the lands would return to France. After the American colonies won independence from England, many new settlers from the Kentucky and Tennessee regions came further west, crossing the Mississippi River to settle the Indian lands in Arkansas, an important aspect in Arkansas genealogy. With the Louisiana Purchase by the United States from France in 1803, the lands of Arkansas became part of the Mississippi Territory. People from the eastern states moved into Arkansas after they had been granted 160 acres of land bounty for military service from the War of 1812. In 1819 the Arkansas Territory with a population of 14,000 inhabitants (not counting native Indians) was created from the Mississippi Territory. The capital of Little Rock was established in 1821. Over the years up to 1836, more Indian tribes were moved out and new settlements opened up for whites in Arkansas. The Native Indian populations; the Osage and Quapaw had resided in the area for a very long time. While the Cherokee and Choctaw received land grants from the federal government for land in Arkansas, after having been forced out of their homelands in the east. Other tribal groups in Arkansas included the Delaware, Shawnee and Caddo. By 1820 to 1825, the Osage tribes were moved to the Oklahoma Territory. In the early 1800s it was an agricultural based territory. It was admitted as the 25th state on June15, 1836. 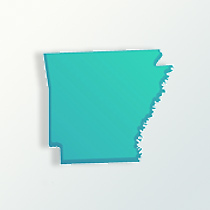 Arkansas comes from Arkansa, the French name for Native Indians of the Quapaw tribe. The letter ‘s’ was added as a plural, though it remains silent in the pronunciation formally adopted by the state’s legislature. New settlers continued moving in during the 1830s and 1840s from eastern and southeastern states. For Arkansas genealogy note, additional land bounties were given to men who served during the Mexican War of the 1840s. Between 1861 and 1865, nearly half of the soldiers from Arkansas served in the Union Army and half in the Confederate Army, yet Arkansas had seceded from the Union in May 1861. Due to the conflict, many Arkansas citizens moved to nearby Texas, Missouri and Illinois. From the late 1860s into the 1890s a large wave of new immigration came from numerous European nations. These were new settlers coming to Arkansas to establish roots between the Arkansas and White Rivers. Into the 20th century the economic was mainly agricultural. It would remain agricultural centered until the 1950s when industry surpassed agricultural as the main economic commerce. Approximately 20 percent of the population is African-American heritage, many with lineage back to the days as a territory.